– from The Cat and the Wizard, by Dennis Lee, published by HarperCollinsPublishers Ltd. Bookmarked at Casa Loma, Toronto, September 29, 2016. The Cat and the Wizard by Dennis Lee, with illustrations by Gillian Johnson, is the 17th Bookmark on Canada’s literary trail and the first Bookmark for children. It was unveiled on September 29th, 2016 by Dennis Lee at Toronto's iconic landmark Casa Loma. This first children’s Bookmark is a celebration of literature and literacy, and an inspiration to a younger generation to find magic in books. Dennis Lee has published collections of poetry for adults and children, including the Canadian children’s classic Alligator Pie. 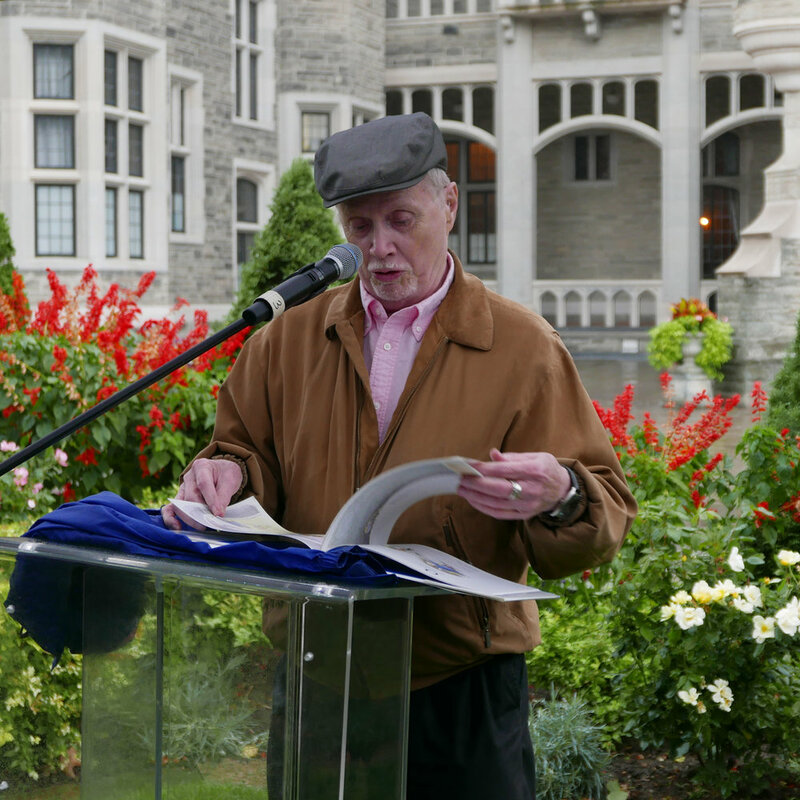 His writing has received multiple awards, including the Governor General’s Award and the Mr. Christie Book Award. The Cat and the Wizard is published by HarperCollinsPublishers Ltd. and first appeared as a poem in the collection Nicholas Knock and Other People, published in 1974 by Macmillan of Canada. Dennis Lee was born in Toronto, and he lives there still. Gillian Johnson is the prize-winning author and illustrator of over thirty children’s books, published worldwide and translated into ten languages. Johnson grew up in Winnipeg and now makes her home with her family in Oxford, United Kingdom. This excerpt and illustration are used with the kind permission of the author and illustrator. Discover the Bookmark and the story behind it online with a special exhibit featuring readings and interviews with Dennis Lee, and illustrations and animations inspired by the poem. The exhibit is produced by Angela Shackel of Accounts and Records and was made possible with the generous contribution of the Good Foundation Inc.